During its nonleague wrestling match on Friday, Kingsway picked up some quick falls en route to a 44-20 win at Vineland. In a battle of 126-pounders, Trent Tutko gained a win with a 17-second fall. Rory Bushby earned a 1-minute, 3-second fall at 160 pounds. Michael Morris claimed the fastest victory, pinning his opponent in 14 seconds. In a clash of heavyweights, Kingsway's Joe Massing edged Erik Gonzalez in a 3-2 decision at 195 pounds. At 152 pounds, Joshua Nagel defeated Vineland's Yusuf Yilmaz in a 9-7 decision. Haddonfield 43, Newton 23: Liam McCormick defeated Nick Zaremski via a 2-1 decision at 195 pounds for the visiting Bulldogs. Evan Finnegan earned a quick fall in 24 seconds at 106. Paulsboro 55, Audubon 16: Brian Richards and Colin Donnelly made for an epic matchup of 145-pounders, with Richards coming on top with a fall in 7:30 at home. At 126 pounds, Mike Keen picked up a win with a 34-second fall. Pemberton 51, Pinelands 22: Dazmier Waren earned a 6-3 decision over Robert Hart at 220 pounds to aid the Hornets in a victory at home. 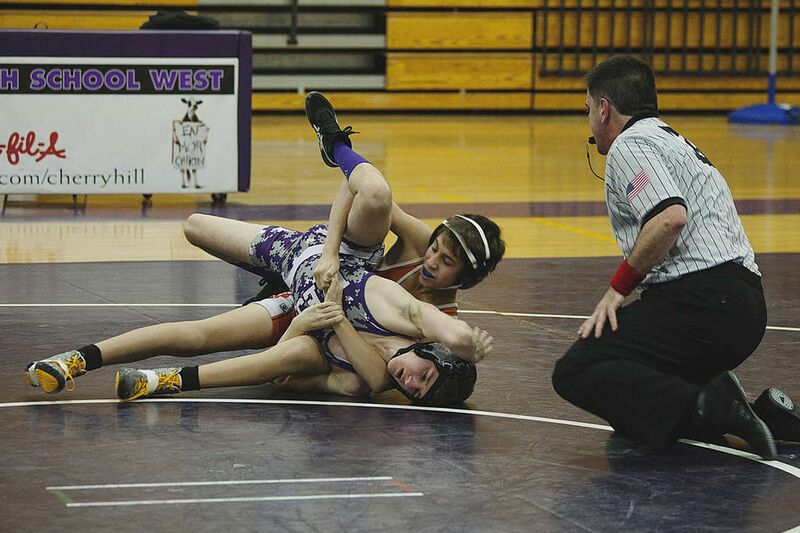 Cherry Hill West 38, Cherokee 33: At 182 pounds, Jeremy Weingardt earned a fall in the first minute of a win at home. Cherokee's Jordan Krug outlasted Jayson Peralta at 195 pounds, winning via fall at 5:12. In the 145 pound class, Jake Moore bested Noah Bell, winning on a pin in 3:19. Seneca 39, Washington Township 37: Joe Machio earned a 45-second fall for visiting Seneca. Mike VanHorn captured a milestone, winning the 100th match of his career in a 10-4 decision against fellow 126-pounder Geoffrey Lake. He is the eighth 100-match winner in school history. Collingswood 45, Northern Burlington 18: In a matchup of 170-pounders, Fred Miller defeated Michael Taulane in a 9-7 decision at Northern Burlington. In a matchup of 195-pounders, Pat Miles earned a pin in 36 seconds. Collingswood 46, Rancocas Valley 17: Nick Barnes won in a 2-1 decision over Ryan Jang. At 145 pounds, Sam Henderson bested Daequan Jackson-Swoope, earning a fall in 5:51. Holy Spirit 88, Millville 41: Jordan Taylor and John Middleton each scored 20 points, as 13 Spartans registered points in a win at home. Egg Harbor Township 35, Absegami 31: Down by six heading into the fourth quarter, Shemar Williams netted seven of his 11 points in the period to carry the Eagles to victory at home. Quanif Ames, Omar Dixon, and Carmine Fiore each scored eight points. Oakcrest 39, Lower Cape May 37 (3 OT): As time expired in the fourth quarter, Pat Holden sank a three-pointer to tie the game for Tigers, leading all scorers with 22 points. But AliQuan Stokes sealed an Oakcrest win in triple overtime by going 3 for 4 at the foul line in the final 30 seconds. LaShawn Elliot led the Falcons with 12 points. Wildwood 67, Pennsville 51: Jahnire Coleman led the visiting Warriors with 22 points. He added seven blocks. Brendan Bean grabbed six rebounds.